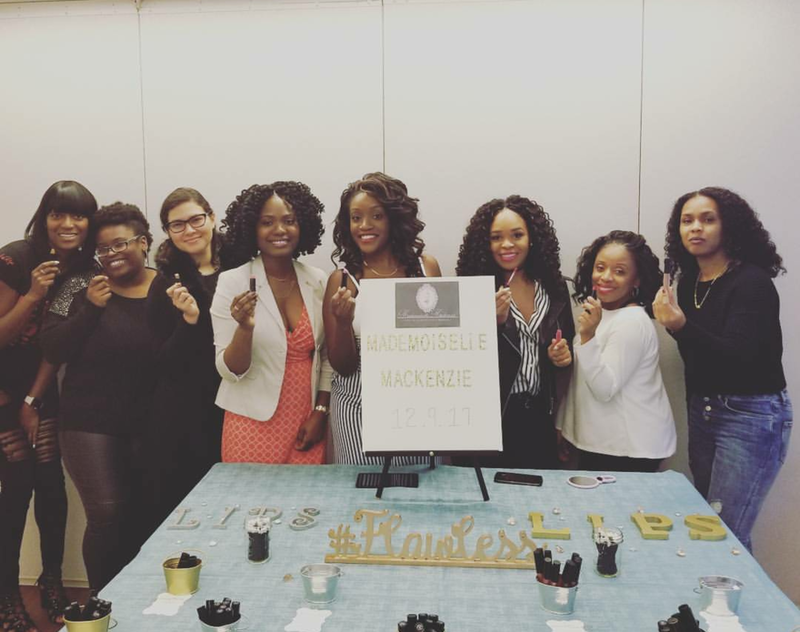 Mademoiselle Mackenzie Cosmetics is linking up with Uptown Underground Market’s pop-up shop, Saturday, November 24, 2018. Come shop amazing savings and support an artisan and author market made to empower black women in the heart of Harlem! When you buy from a black business, you support a whole community! Mama Smoothie is hosting their very own Pop Up Shop / Day Party and has invited YOURS TRULY to be a part of it? SIGN UP ON EVENTBRITE FOR YOUR FREE TICKETS! We can't wait to see our Mackenzie's Mademoiselles and all of our newcomers. Until then, POUTS UP BEAUTIES! Remember when we said Mademoiselle Mackenzie Cosmetics had a few events lined up this year? Well, we were not joking. We're coming out Saturday, May 26th and connecting with Haitians Who Blog in Brooklyn, New York. Haitians Who Blog will be connecting content creators, entrepreneurs and professionals from 12:30-3pm at Brooklyn Commons. This is powered with great encouragement for the Haitian community to grow and recognize each other. We stand firm in representing our Haitian heritage and will fully support the cause. If you need inspiration to start a business, searching for possible business partnerships or share ideas, then this is the event for you. In the midst of all the networking and mingling, be sure to stop by Mademoiselle Mackenzie's bedazzled table and shop the greatest lip products there are. Register on Eventbrite and get your tickets to a great event with cocktails and great music! On Saturday, May 12th, we're in Brooklyn for Bronze Magazine's Pop Up Shop at Brooklyn Commons. Do you have your Mother's Day gifts, do you have cabin fever from this brutal Winter, are you looking for a place to hang out with your girls? Well this pop up shop has it all for you. Shopping, entertainment and FREE cocktails. Come grace us with your presence and BE SURE to stop by Mademoiselle Mackenzie's fabulous table and shop the greatest lipsticks, lip glosses and lip pencils there are . Register for your free tickets on Eventbrite! We'll see you lovelies there! Faith & Fashion collide to show you that you can be fashionable while giving God praise. Celebrity stylist J. Bolin and award winning MUA and photographer Joanna Petit-Frere are headlining to give you glam to the most infinite level. Male and female vendors will be set up to give you beauties and beaus the hook up. Oh, and yours truly will be set up at our glamorous table with our amazing products and new spring goodies. You don't want to miss this event!!! Come by and check us out this Saturday, February 10th at Elucid Magazine's Fashion Hub. This is a Fashion and Beauty Expo being held during New York Fashion Week 2018 to captivate all your senses. Our table will be set up with our luscious products for you to have a personal experience and be amazed. Hope to see you dolls there. 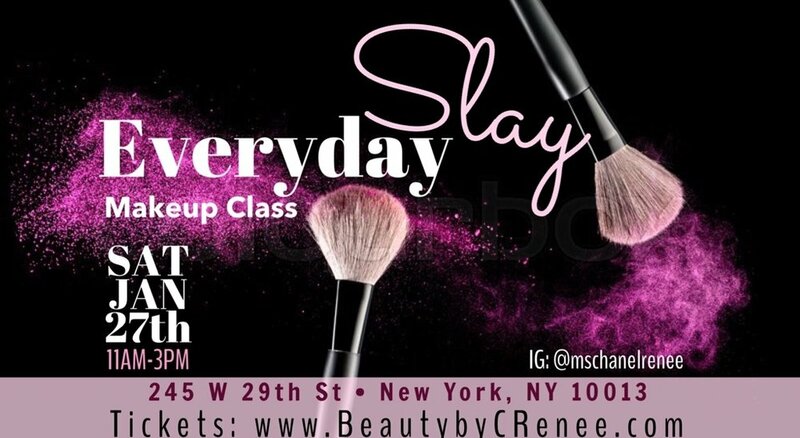 Ms. Chanel Renee is hosting an Everyday Slay makeup class on Saturday, January 27th! She's giving you ladies all the tips and tricks for a beat face. OH and guess who will be one of her beauty vendors? That's right, YOURS TRULY will be aboard. Mademoiselle Mackenzie Cosmetics is giving away a fully loaded swag bag to a lucky guest. There will be FREE cocktails, FREE lashes, a professional photographer and a selfie station for you beauties! Use Code: TAKE10 for 10% off your tickets. Click on the link to register for your tickets. You definitely don't want to miss this event. Until then, Pouts Up Beauties! Ladies and Gents! Come out and celebrate the launch of Mademoiselle Mackenzie Cosmetics' luxurious lip line! The first 15 registrants receive Swag Bags. The next 15 registrants receive a 10% discount off their entire purchase. Register on Eventbrite for your free tickets ! Come and taste are signature cocktails and food. Be a witness to our launch and a part of our live demos as we have you dancing along to our music. Are colors and textures will not disappoint. You do not want to miss this! See you there! Hey Dolls!!! Shout out to The Grind that airs Mondays from 8-10pm on MuzikVibe.com. Mlle Mackenzie will be on talking about our line and launch party. Tune in Monday 12.4.17 we will be on in the 9 o'clock hour.